Preheat broiler or grill. Divide ground beef into twelve flat patties. Partially saute bacon. Mix pecans, parsley, onion and butter together. Spread mixture on six of the patties. 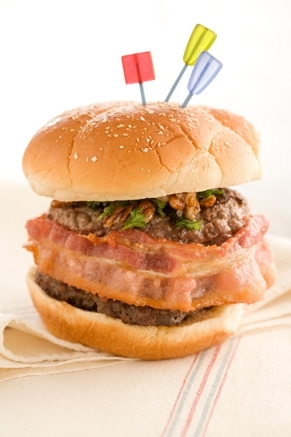 Top with remaining six patties and seal the edges with the partially sauteed bacon and secure with a wooden toothpick. Broil or grill 10 to 15 minutes, turning once.